Little Common goalkeeper Matt Cruttwell was among the scorers as the football club chalked up its 20th league win of the season. Cruttwell scored Common’s third goal in the 4-1 victory at home to Selsey yesterday (Saturday) with a long kick which bounced over his opposite number in the Selsey goal. On a wet and windy afternoon at The Oval, Common made two changes to their starting line-up with Paul Feakins and Louis Walker coming in to replace the suspended Ryan Paul and injured player-manager Russell Eldridge. With constant drizzle falling throughout the Macron Store Southern Combination League Division One match and conditions deteriorating, it was never going to be a classic and the Commoners chose to defend the wind in the first half. Common carved out the first opportunity, with Wes Tate seeing a goalbound effort blocked in the area before Lewis Hole’s header drifted wide. At the other end, the visitors were restricted to long range efforts and Cruttwell twice had to be alert as the ball zipped across the greasy surface. A neat interchange of passes on the edge of the Selsey area released Jamie Crone and his powerful drive was well saved by the visiting goalkeeper. Crone opened the scoring just before half time when he raced on to a Walker throughball before slotting past the advancing goalkeeper. Kicking with the wind, the Commoners enjoyed an early spell of possession at the beginning of the second half and doubled their lead in the 57th minute. The Selsey goalkeeper dropped a routine catch from a Sam Ellis cross at the feet of Hole, who rolled the ball into the back of the net for his 30th goal of the season. 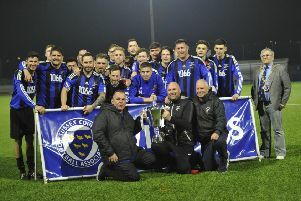 Common’s third goal came from the most unlikely source when a long drop kick from Cruttwell bounced over a backpeddling Selsey goalkeeper and into the roof of the net to all but seal the victory. The visitors went on to enjoy their best spell of the match and almost hit back from a free kick on the edge area following a weak back pass by James Maynard, but Cruttwell tipped the effort round the post. After Common failed to clear the resultant corner, the visitors did pull a goal back when the ball was fired in at the near post by Sam Agostinelli. With conditions worsening, the Commoners tried to keep possession better to nullify the Selsey threat and soon created chances of their own. Crone forced a smart save from the visiting stopper before the same player was upended in the area and Tate dispatched the ensuing spot-kick to complete the scoring. Common: Cruttwell, Feakins, Walker, Ward, Maynard, Parsons, Tate, Winter (Collier), Hole, Crone, Ellis (Smith). Southern Combination League Division One top half (played-points): 1 LITTLE COMMON 24-61 (+56 goal difference), 2 Langney Wanderers 24-57 (+42), 3 Lingfield 23-49 (+40), 4 Wick 23-44 (+28), 5 Mile Oak 24-44 (+11), 6 BEXHILL UNITED 24-43 (+24), 7 Ringmer 25-42 (+16), 8 Selsey 22-37 (+11), 9 Steyning Town 23-31 (+15).